Neepwaantiinki, the Myaamia word meaning “learning from each other," is a rich interpretation of “partners in learning," a phrase that Miami University and the Miami Tribe of Oklahoma have used for years to describe their reciprocal relationship. Sharing a common name and place, the connection between the University and the Tribe spans more than four decades and has evolved into a multi-layered collaboration built on trust, respect, and a shared commitment to education. In the Fall of 2015, the Miami Tribe of Oklahoma and Miami University embarked on the development of an educational initiative to increase awareness about their long-standing and strong partnership. That initiative was launched in October 2017 with the unveiling of the Myaamia Heritage Logo (MHL) and the signing of a Memorandum of Agreement by Miami University President Gregory Crawford and Miami Tribe of Oklahoma Chief Douglas Lankford. While developing the MHL and this educational platform, Miami University has respected the proprietary authority of the Miami Tribe and invited their collaboration on and approval of all aspects of this process. Daryl Baldwin, Director of the Myaamia Center at Miami University, has said, "Throughout this process, the federal sovereign status of the Miami Tribe and their proprietary authority over Myaamia language and culture was acknowledged. It is within this environment of mutual respect that the Miami Tribe feels comfortable sharing, expressing and educating all faculty, staff and students about this unique relationship of collaboration and partnership." Joint Design: The MHL was jointly designed by Tribe and University designers. Jointly Owned: The MHL is jointly owned by the Tribe and University. The partners own a federal registration of the logo. Joint Approvals: All marketing collateral, communications, and merchandise for the program is jointly approved by the Tribe and University. Student Support: All royalties from the sale of the Myaamia Heritage Collection merchandise support Myaamia student scholarships. 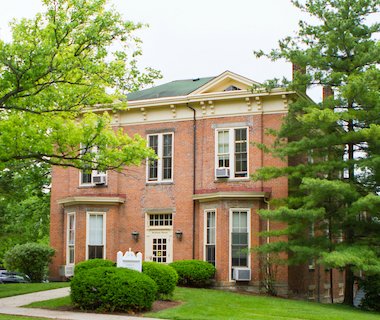 The Coordinator of Miami Tribe Relations serves as the major on-campus resource and support person for Miami Tribe students who attend Miami University. The coordinator serves as one office within the Myaamia Center. Miami University and the Miami Tribe of Oklahoma commit themselves to work collaboratively, making concerted efforts to avoid cultural appropriation.